Abstract: Upgrading the BIOS (Basic Input Output System) of your computer's motherboard, also sometimes called flashing, used to be a complex operation full of potential perils for your PC. Upgrading the BIOS (Basic Input Output System) of your computer's motherboard, also sometimes called 'flashing,' used to be a complex operation full of potential perils for your PC. The task involved downloading the correct BIOS file, the proper CMOS chip flashing software, rebooting the PC into DOS mode, applying the correct commands and then waiting in suspense until the update finished. All the while there was a lurking danger - if something went wrong, you would be left with an essentially unusable motherboard… Not an operation for the novice, and not one that even PC enthusiasts approached with enthusiasm. In recent years, things have gotten a whole lot more friendly on the BIOS upgrade front, and markedly more failure resistant too. It's likely that the major motherboard manufacturers realized that consumers were simply not bothering to update their motherboards due to the complexities involved. Since BIOS updates can add new features and considerable stability to their products, it was definitely in the manufacturer's best interest to find an easier and more fault resistant way for consumers to update a BIOS. Flashing the BIOS is still not an operation that the large majority of PC users are even aware of, and that's something that we'd like to try to change. In this article PCstats will describe some of the methods you can use to upgrade your computer's BIOS, and explain what a BIOS is, and does. PCstats will also help walk you through the process of locating potential updates, and deciding if you need them. What does a BIOS do? The BIOS is a set of instructions contained on special type of volatile memory chip built onto your motherboard. As the name suggests, the BIOS provides a Basic Input/Output System… More specifically, it enables you to use the keyboard, see a display on the monitor, access the hard drive or CD drive, etc., all without the need for an operating system. The BIOS is the software that carries you from the moment you power on your computer to the point where the operating system begins to load, providing the instructions necessary to access the hard disk, memory and other hardware. This is a very simplistic definition though, as the BIOS has many more functions. All the hardware attached to the motherboard, such as the memory, processor, video card and disk drives, can be configured to a greater or lesser degree through the BIOS. Memory timings, processor speed and overclocking, hard disk detection and booting are all properties controlled by the motherboard's BIOS. As you may be aware, you can change the BIOS settings through an interface generally reached by pressing the DEL key on your keyboard immediately as your system begins to boot. Every modern motherboard contains a CMOS (Complementary Metal-Oxide Semiconductor) memory chip which is powered by a small battery, storing any changes you have made to the default BIOS configuration. This is why you can restore your BIOS to its default settings simply by removing the motherboard battery for a few minutes. Upgrading the BIOS is a different procedure. 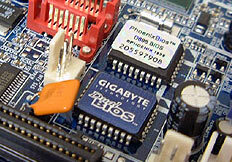 The motherboard manufacturer provides a file which will overwrite the default file on the CMOS chip itself, providing the motherboard with a new or updated set of controls. Pg 2. Why do you need to upgrade?